WAMS was established in June 1986 after many years of lobbying to provide a service to the Aboriginal community. The first Board of Directors moved a resolution to treat ALL people. Currently, 40% of our clients are non-Aboriginal. WAMS was originally located on the corner of Fox and Sutherland St with a staff of five and in 1989 moved to their current location in Pitt St.
WAMS now has a staff of over one hundred (including visiting personnel) making it one of the largest employers in Walgett and they endeavour to support their staff in whatever way they can and offer personal and professional development with training to upskill and fun days to boost moral and comradeship. WAMS has since added a Dental wing (which also has a sound proof room for the Hearing Program), a Children’s Mobile Service and a Community Garden at Euragai Goondi, which was acquired during this time as well and transformed from an aged care amenity into a child care facility. The latest addition was the Chronic Disease Building which was opened in 2013 by Dame Marie Bashir and WAMS CEO, Mrs Christine Corby OAM. The Community Garden was established to provide fresh fruit and vegetables to members of the community with chronic disease and a Bower Shed has been erected to enable the ‘locals’ that visit the garden to sit and chat with the children who are attending play sessions. WAMS was the first Aboriginal Medical Service in NSW to be accredited (1998) with dual accreditation by the (national) QIC and (state) QMS for organisational operations and General Practice Accreditation (GPA) Plus. This is a major achievement and WAMS recognises the ongoing commitment required to ensure these accreditations continue. The Dental Clinic achieved full accreditation in 2014 through the QIP group and the support of the Australian Dental Association. WAMS now has five doctors who care for the community on a daily basis, a regular dentist, and many specialist and allied health services have been introduced that Walgett would otherwise not have had access to. Health Checks are held annually for children, women, men and the elderly where the majority of health issues are treated on the one day at the one venue. WAMS has for many years provided outreach services to Collarenebri and more recently, Pilliga and Goodooga and have auspiced the Brewarrina Aboriginal Health Service since 2006. Having partnerships and collegiate working arrangements from a local, regional, state and national level has sustained WAMS operations over the years and in 2013 they became a registered training campus of the Aboriginal Health College. 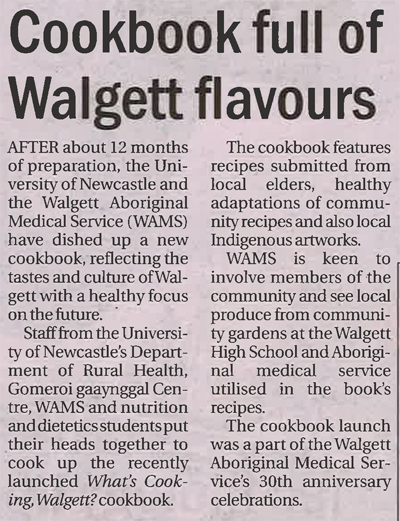 To attract doctors and visiting personnel to Walgett, WAMS has had to provide clean and comfortable accommodation and private residences were purchased to achieve this. These purchases, along with the purchase of buildings for office space and the construction of new office complexes has aided Walgett’s economic growth. 2016 marks the 30th Anniversary of WAMS and they will be celebrating the week commencing the 11 April with an exhibition at the RSL of local artwork, a Community Day on Wednesday 13 April and a Celebratory Ball to finish off with on Friday 15 April. For all that WAMS has done for the community, they should be applauded and recognition given for its many achievements during the thirty years. © Copyright 2019 Walgett Aboriginal Medical Service. All Rights Reserved.